Today’s guest post for Southwestern Breakfast Bake comes from Holly Clegg. She suggest staying in for Mother’s Day. I couldn’t agree more! I’m super happy to stay home and cook. Well, as long as I didn’t have to clean up, that is! 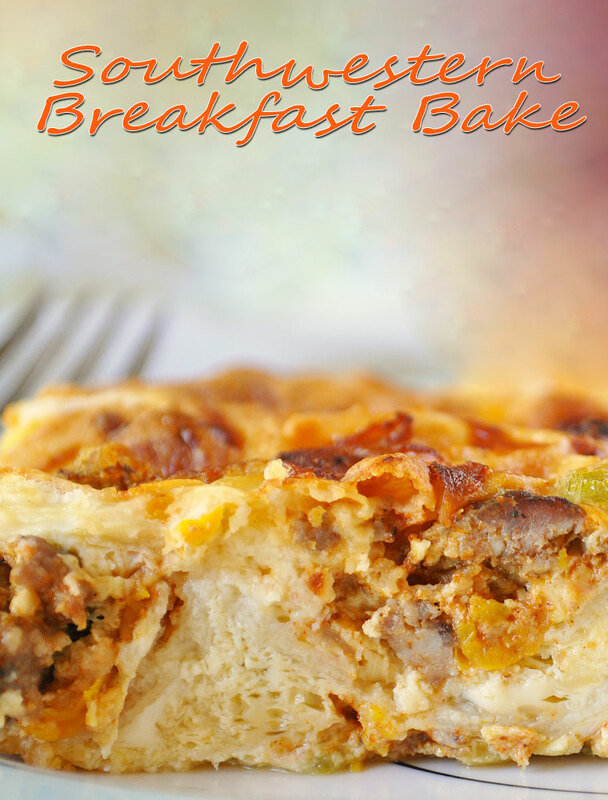 This breakfast bake recipe come from Holly Clegg trim&TERRIFIC® Gulf Coast Favorites. It’s a great way to go southwestern with a fantastic, crowd-pleasing easy morning meal. See more of Holly's recipes at The Healthy Cooking Blog. And don’t forget to check out her other fantastic trim&TERRIFIC® cookbooks on Amazon. I hate going to a brunch on Mother’s Day as the restaurants are always crowded and the menu is usually set. I understand your days are extremely busy, so when a special occasion rolls around, you don’t have all day to cook. A Mother’s Day brunch at your own home can be devised from a few convenient recipes that you can make ahead of time to surprise your family the next morning. I love overnight one dish breakfast casseroles that you pop in the oven the next morning. This recipe is so easy to prepare you can make the night before and refrigerate or whip up in the morning. Using southwestern seasonings and flour or corn tortillas, you have a southwestern breakfast. For a heartier version, add some crumbled turkey breakfast sausage. Pick up some fruit and muffins and your meal is set! If you can find it, add chorizo sausage to the breakfast bake for a very authentic, Mexican flavor. Then garnish with avocado slices. Use gluten free brown rice or corn tortillas instead of flour tortillas if there are any food sensitivities in your family. Preheat oven 350°F. Coat 13 × 9 × 2-inch pan with nonstick cooking spray. In bowl, combine Mexicorn, green chil­ies, and green onions. Line bottom of pan with layer of tortillas, top with half of the corn mixture, then half of the shred­ded cheese. Repeat layers. In another bowl, whisk together remain­ing ingredients. Pour over layers in pan and let sit 10 minutes. Bake 30–35 minutes or until puffed. Photo and recipe used with permission of the author. Posted in Breakfast, Gluten Free, Recipes and tagged casseroles, egg recipes, Holly Clegg, Mother's Day on May 2, 2011 by Anne-Marie Nichols. That sounds delicious! And very healthy, too. Been looking around the site and loving the recipes, so nice to see so many healthy options! Wonderful low calorie breakfast packed with flavor. It looks satisfying and delicious! Hope you had a wonderful Mother’s Day, Kristi!